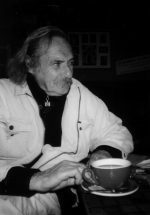 Jack Hirschman was named poet laureate of San Francisco by Mayor Gavin Newsom in 2006, not long after this interview was done in 2005. At the time, Jack was living with his wife, the poet Agneta Falk, in a tiny room crammed with books up in the old Columbus Hotel, above the Caffe Trieste in North Beach. Every day one could find Jack sitting in the cafe with his cup of coffee, reading or writing or conversing with any of the many characters hanging out there at any time of the day. Jack has a nice old-fashioned New York accent and because of that, he can do a perfect impression of Walt Whitman, perhaps thanks to his voice being filtered through voluminous white whiskers, the way Walt Whitman’s voice must have too. Jack’s been a teacher, an activist a translator, he’s written some fifty books and always seems to be happy. Agneta Falk is also a very fine poet. If you would like to order his Goodie, please send $5 using the paypal button on the Shop page of this web site. That price includes postage within the US. For any foreign orders, please send me an email.